My three-year-old daughter LOVES for things to match. She will get very distraught if she thinks her socks don't match her shirt or if her hair accessory isn't exactly the same shade of pink as the flower on her pants. 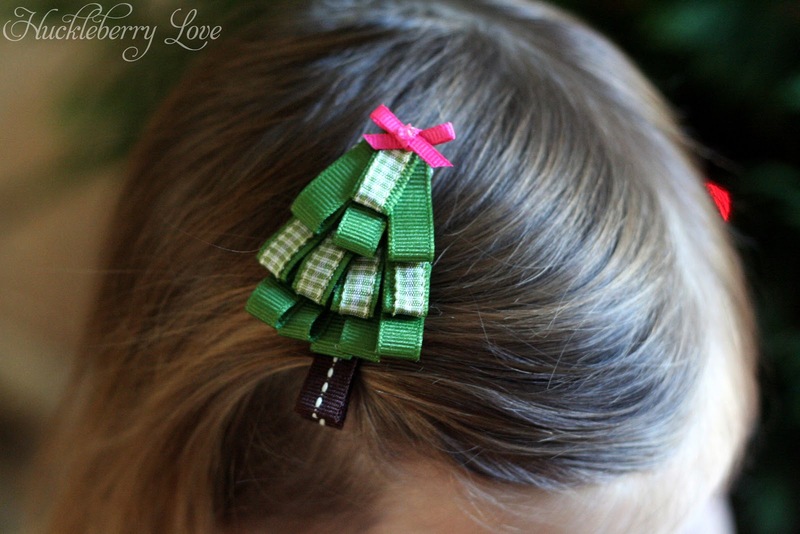 So when I made her the Ribbon Christmas Tree shirt, she immediately asked for a Christmas tree hair clip "to match". 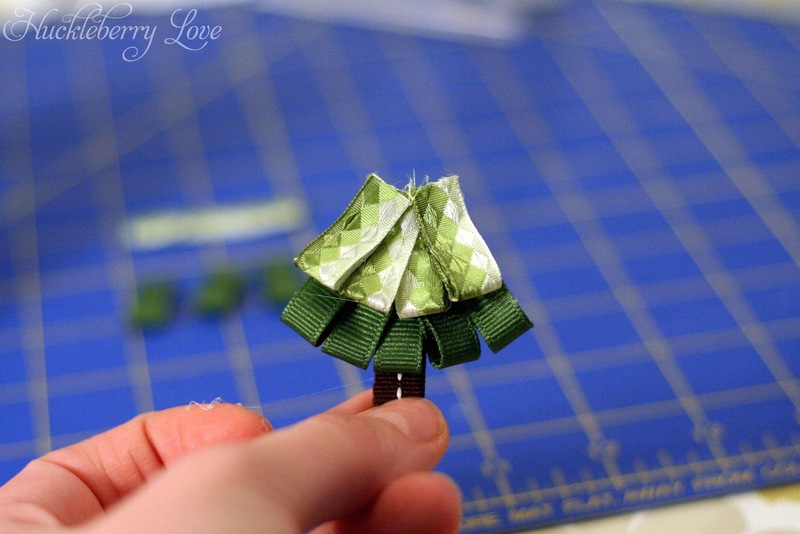 I have never made a hair clip in a certain shape before (other than a bow), but I was up for the challenge. 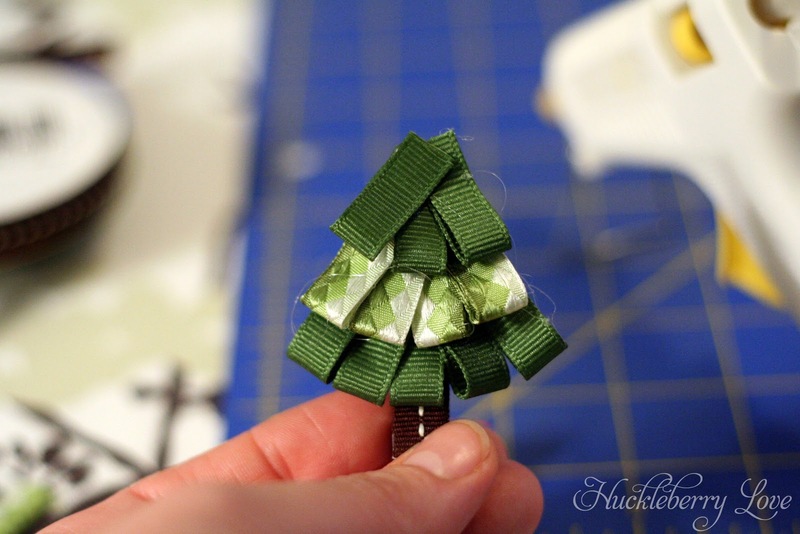 This Christmas tree clip was surprisingly easy to make and Evie was very pleased with the results. 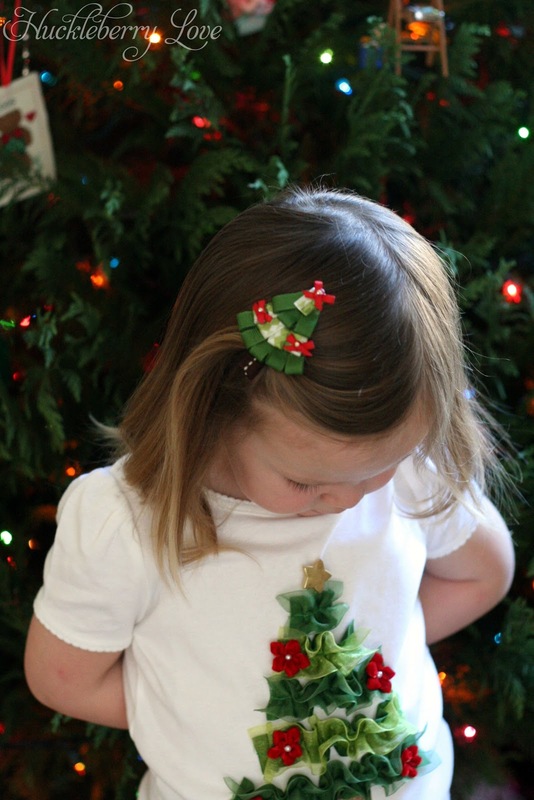 Although, I do have to say I wonder if having a tree on your head and one on your shirt is a little much (but hey, who am I to question a three-year-old's fashion sense?). Please feel free to wear the two trees separately. 1. 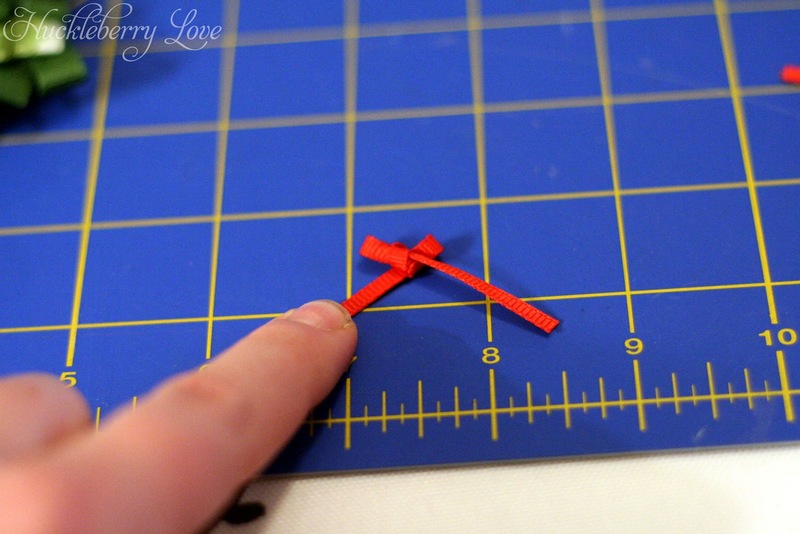 Cut all the ribbon to the correct size. 2. 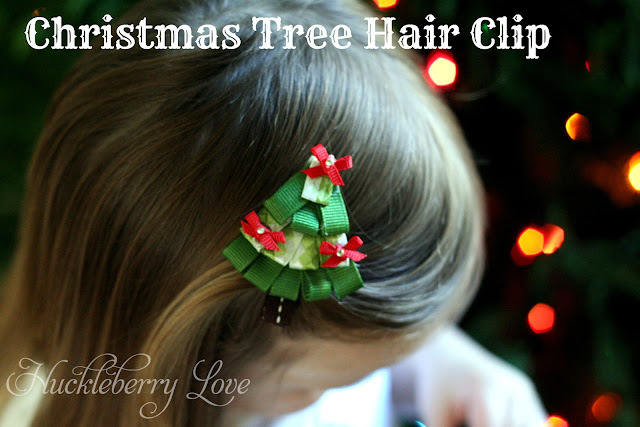 Glue the brown ribbon around the hair clip starting at the underside and wrapping around to the front. 3. 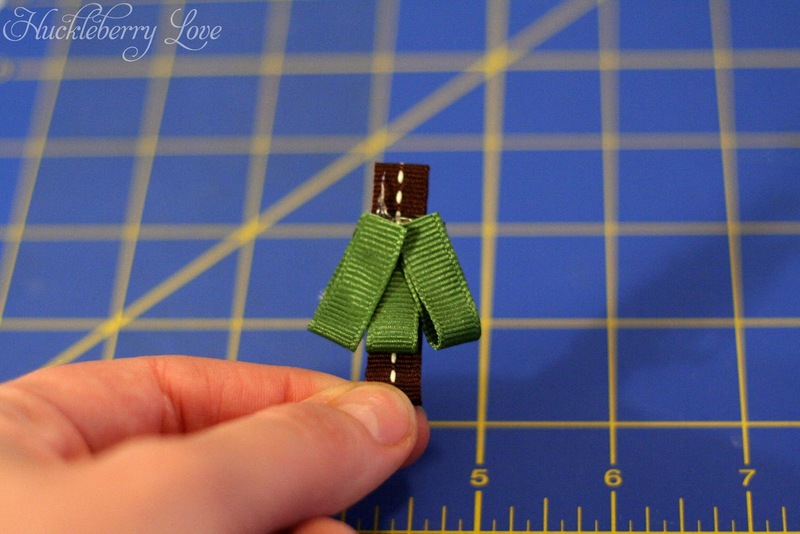 Put a small dab of hot glue on one end of ribbon and then fold the ribbon in half. 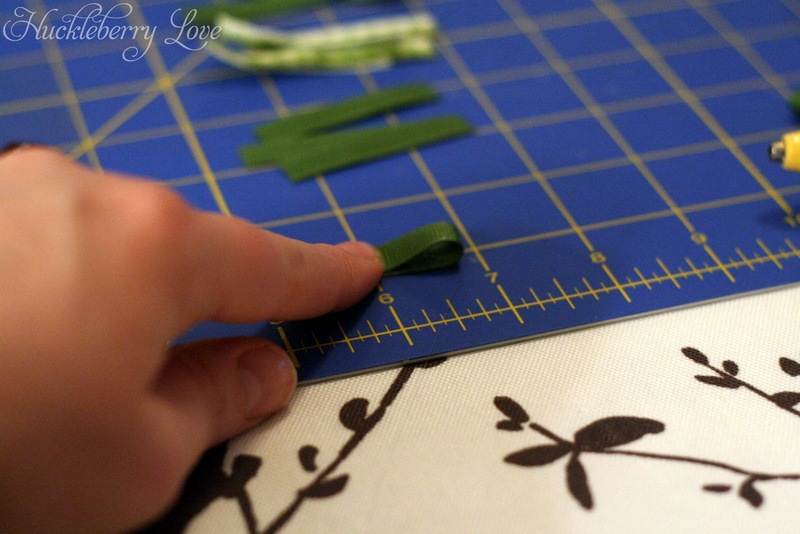 Do this for all the ribbon measuring 2 inches. 4. 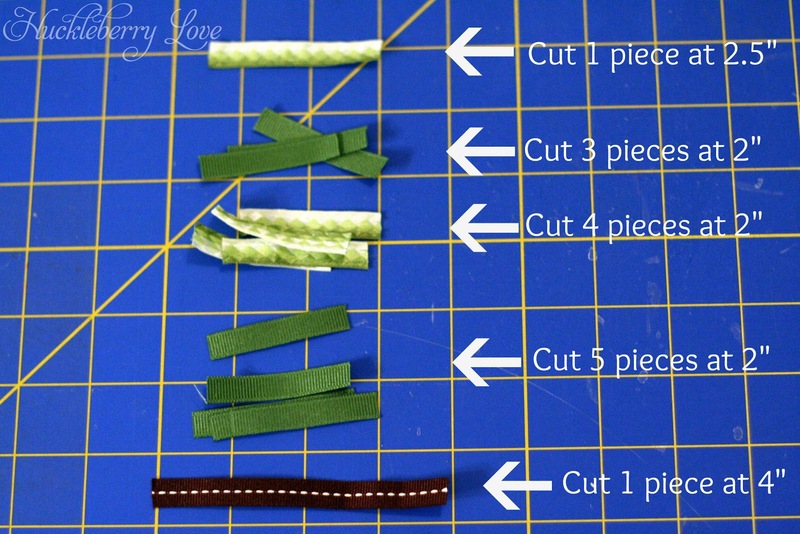 Fold the 2 1/2 inch ribbon down by half an inch and glue. 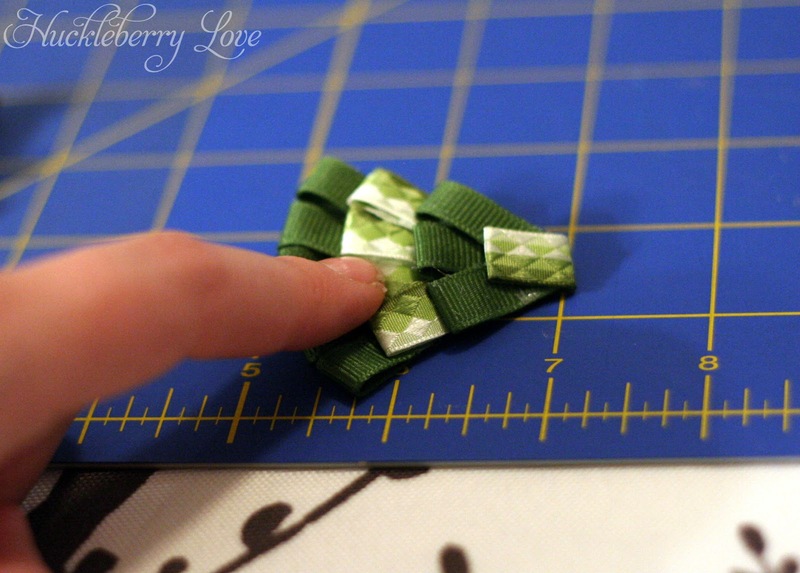 All your ribbon should be folded and ready to assemble! 5. 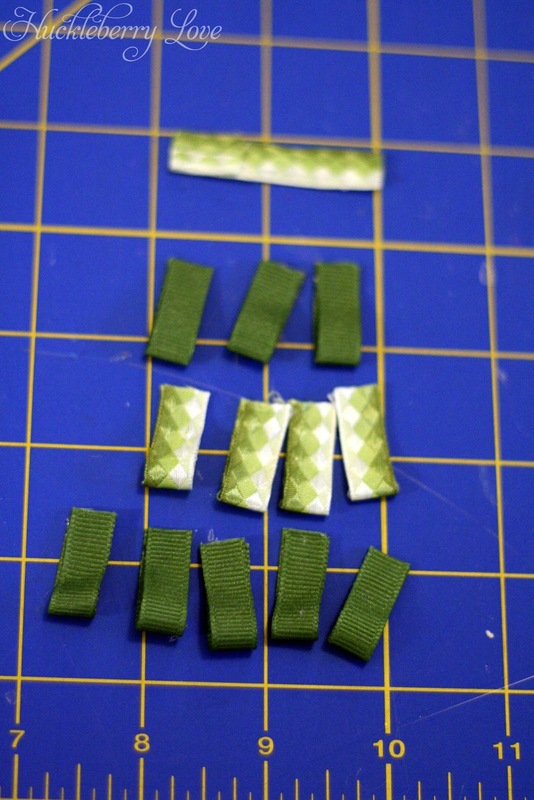 Take one of the solid green ribbons and glue down on the clip. Please excuse my gigantic hand in this picture. 6. Glue down two more pieces, keeping the edges even. 8. 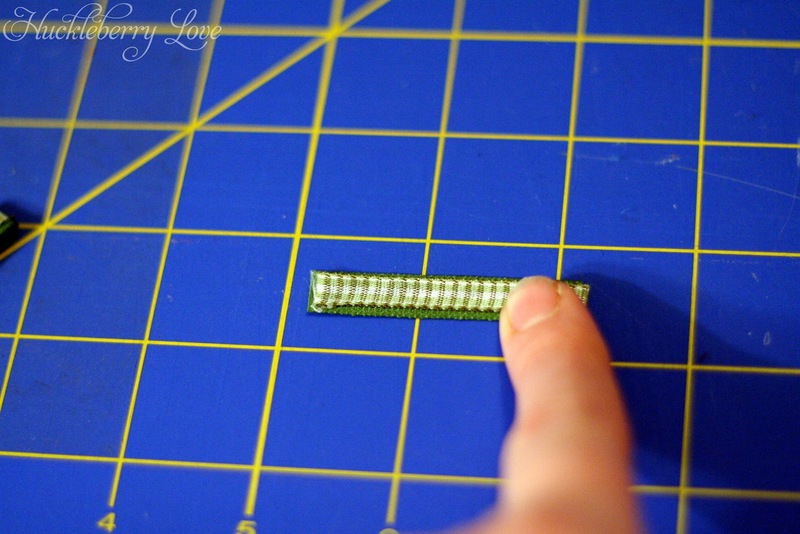 Begin gluing down the second layer and then move on the third layer. 9. 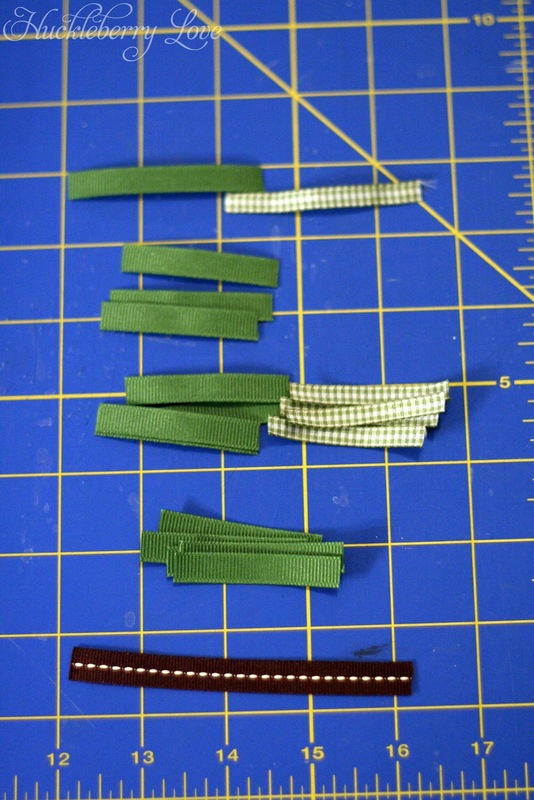 Attach the top section, gluing down only the portion that was folded over. 10. 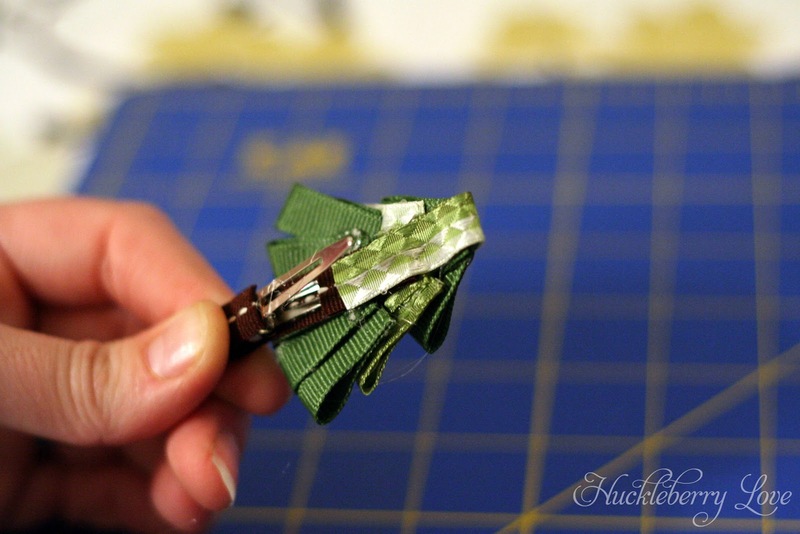 Wrap the remaining portion over and glue down on the back of the clip. 11. 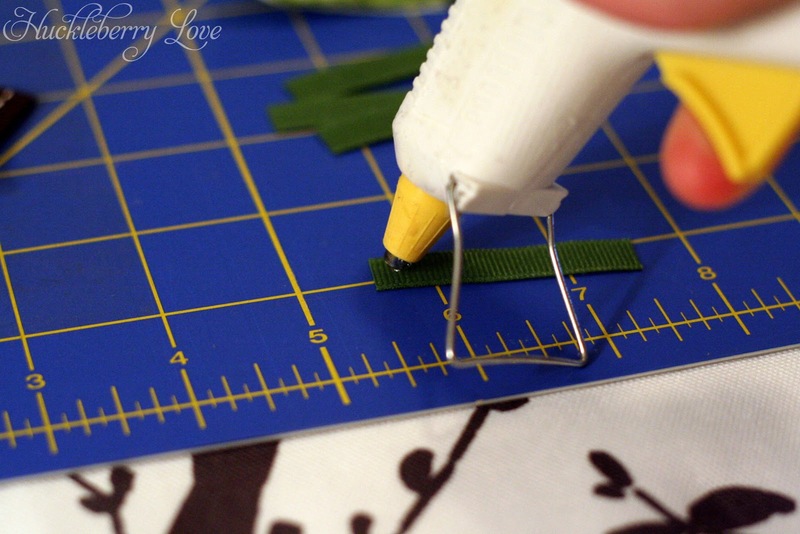 Go back and secure any loose edges with small dots of glue. 12. 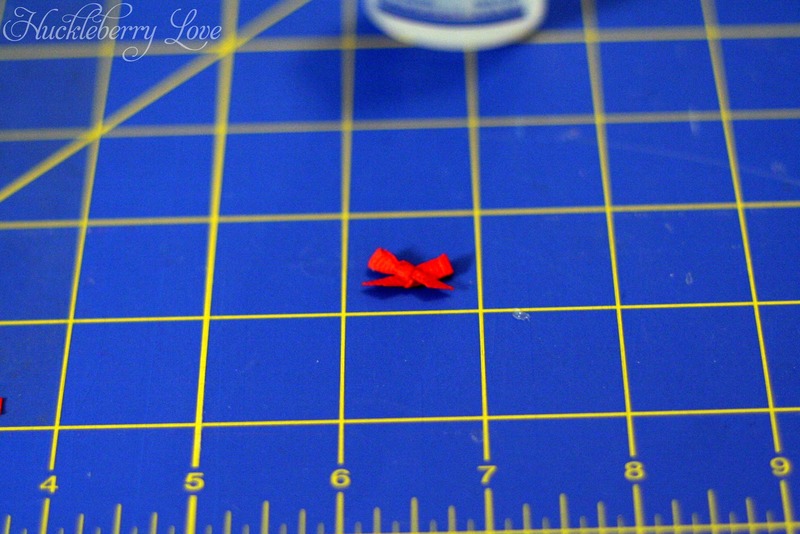 Cut the red ribbon about 6 inches and tie in a bow. 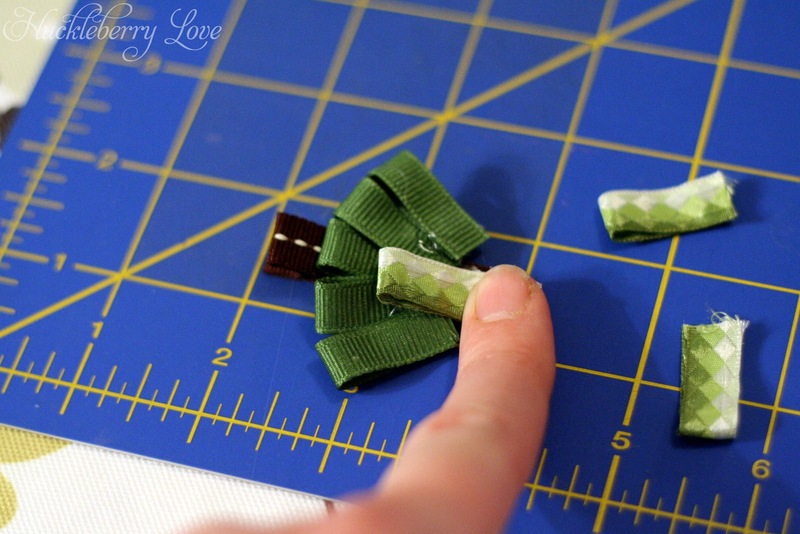 Gently pull on the loose ends while continuing to tighten the bows. 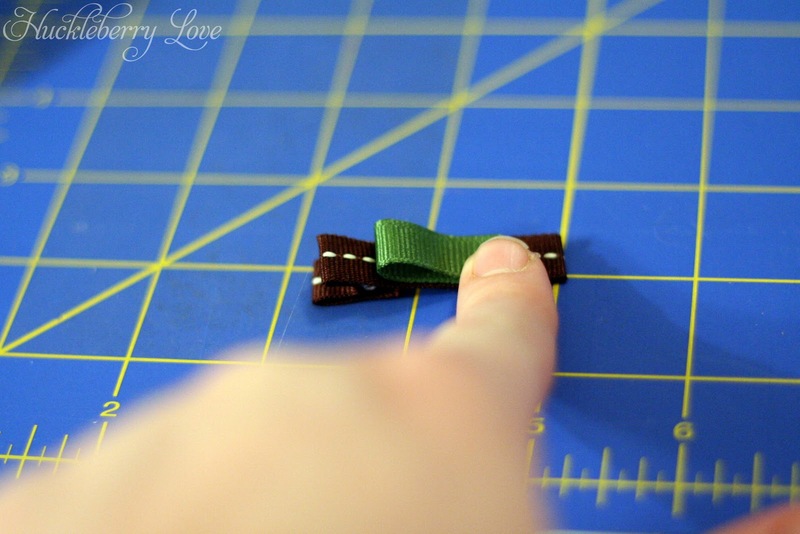 This will give you a cute little bow. 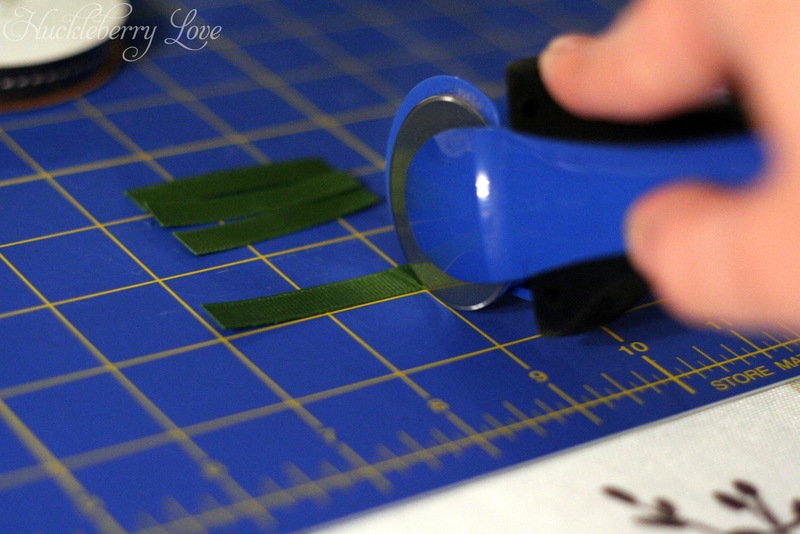 Trim the ends and seal with either Fray Check or by melting with the lighter. 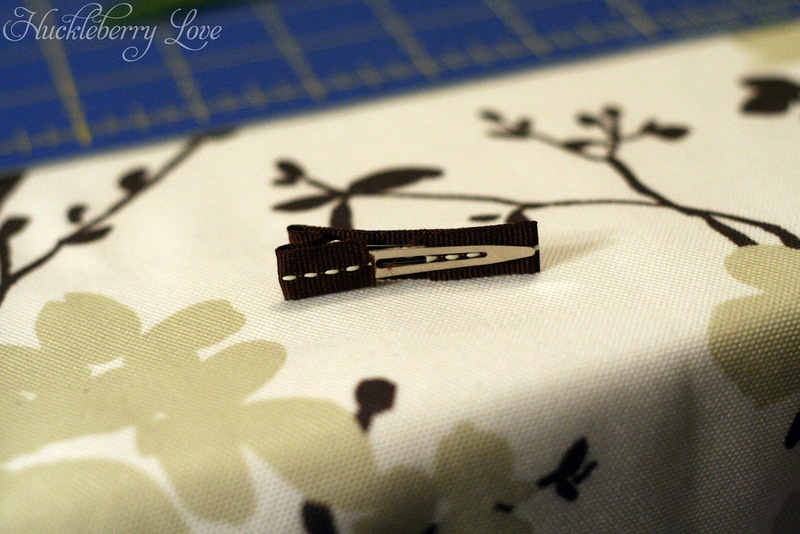 OPTION #2: Using a 1/4" ribbon to make your hair clip. 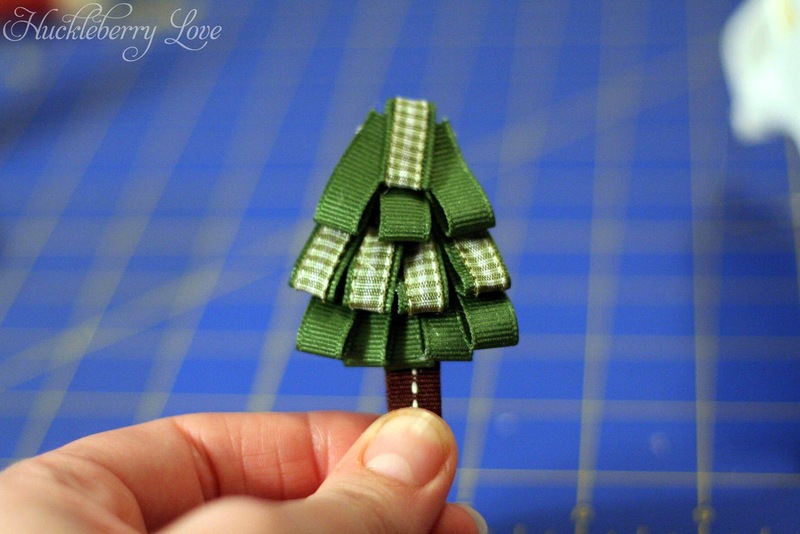 When using the 1/4 inch ribbon, cut 3/8 inch ribbon for each tier of the tree (the solid green ribbon) and cut the 1/4 inch ribbon for the second tier and the top section only. 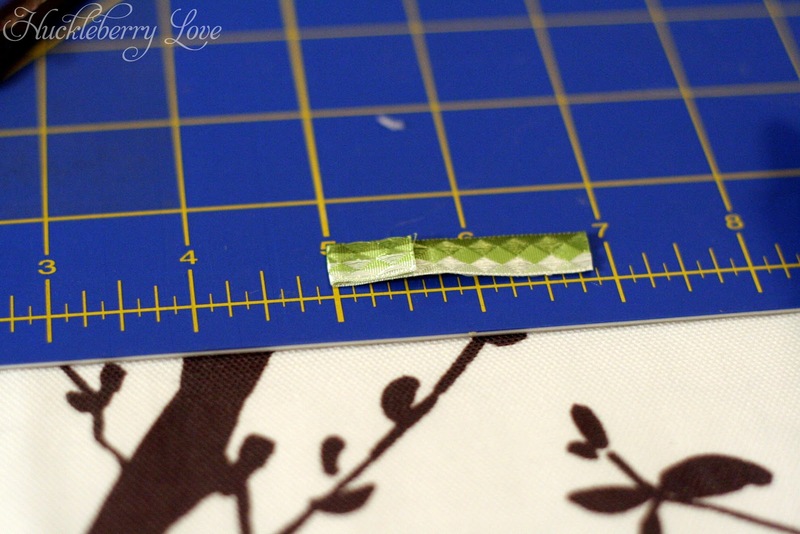 Using a very thin line of glue, attach the 1/4 inch ribbon onto the wider ribbon. 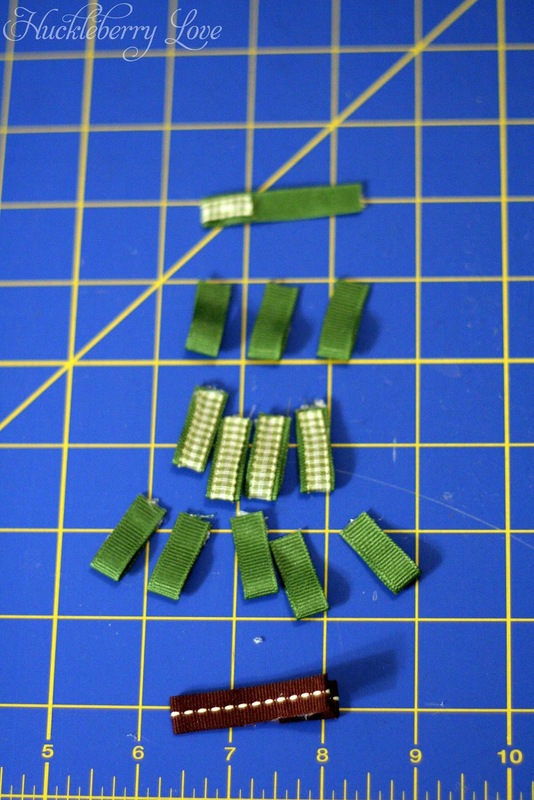 Continue to make the hair clip as outlined previously. 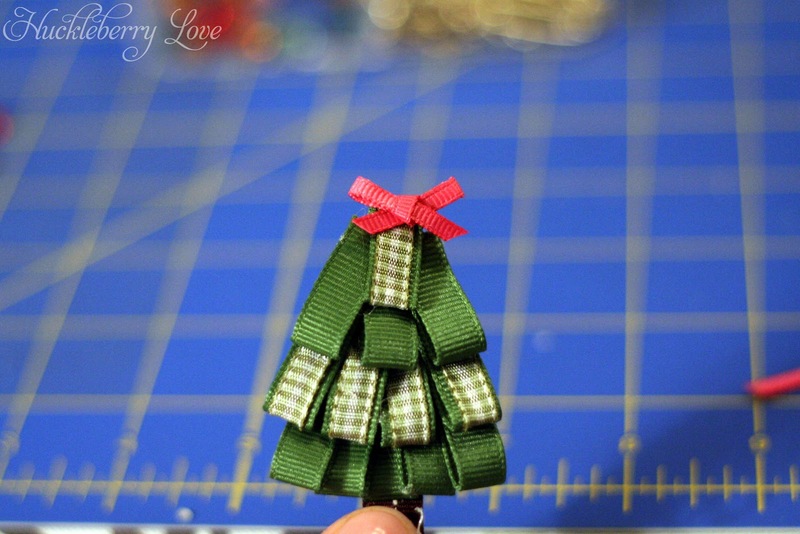 For this clip, I glued the ribbons down a little closer together and it made the tree look more streamlined. 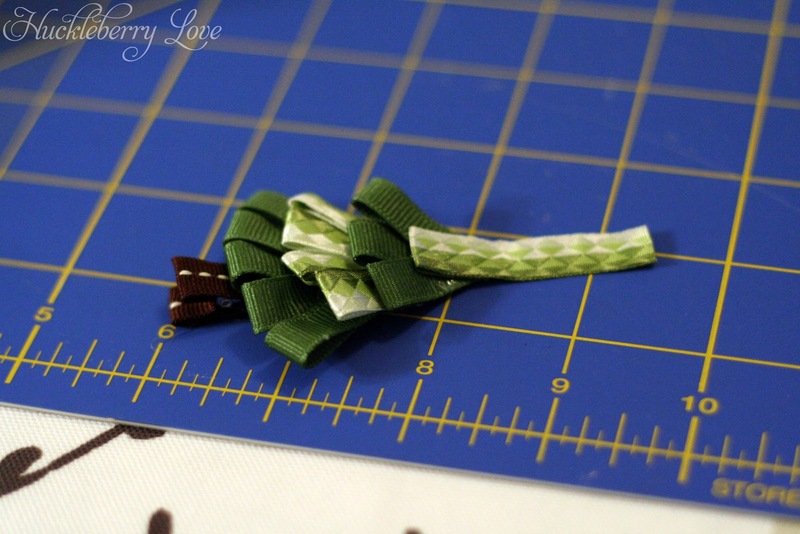 I overlapped the ribbon on the bottom section but still made sure the ends matched up. 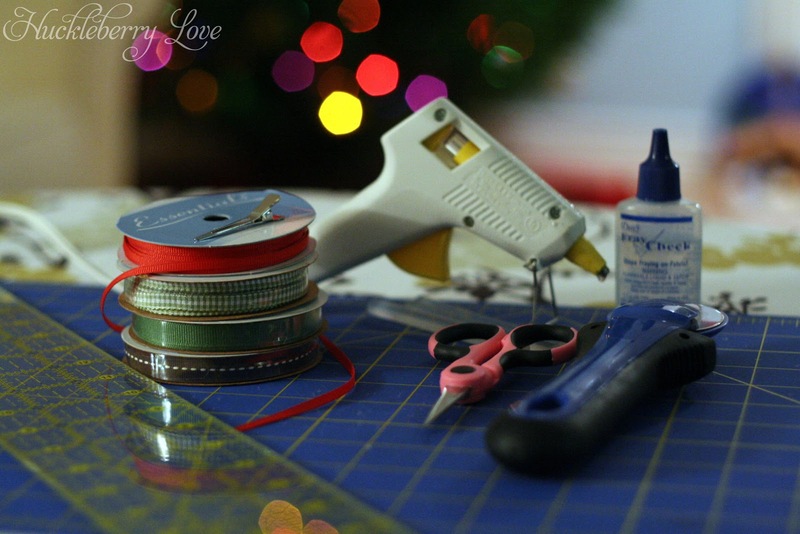 Be sure to remove any little "spider webs" of hot glue. And then, decorate your child with it! 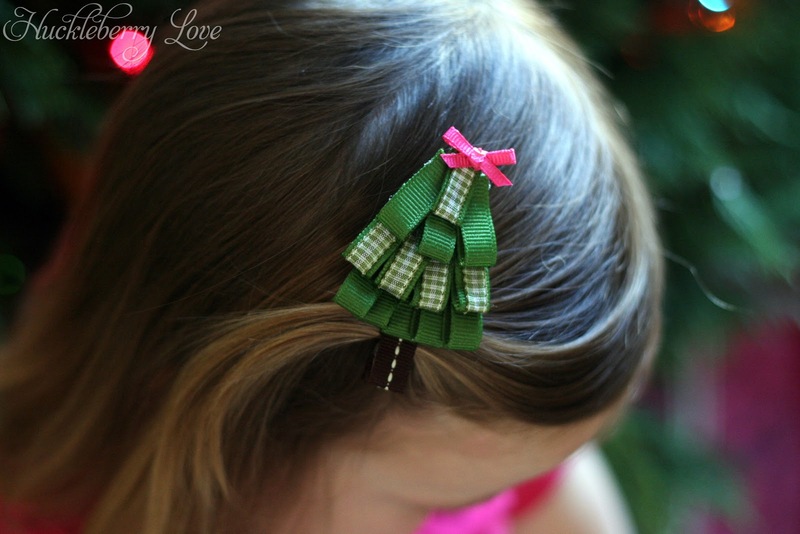 I love how this clip is able to make a simple pink shirt so festive and Christmas-y! 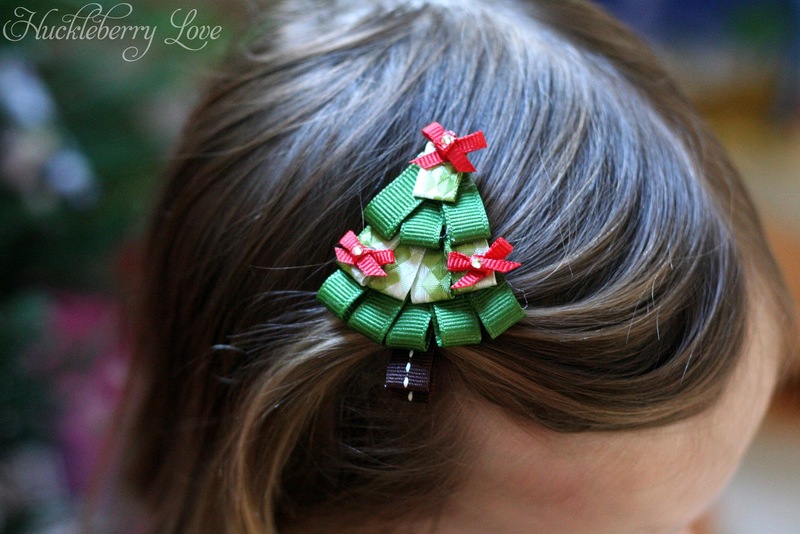 And of course, the shirt and matching Christmas tree hair clip. Now I just need to find her some Christmas tree socks. 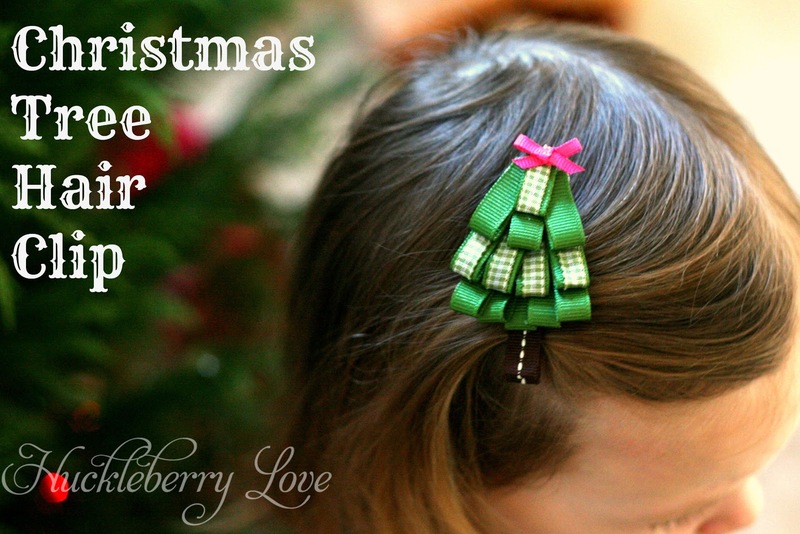 What are your kids wearing for Christmas this year? 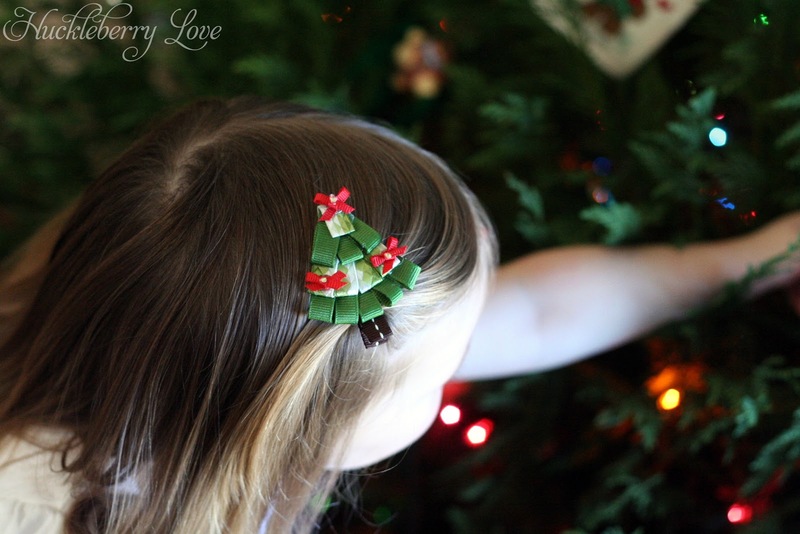 Are your kids as fashion-conscious as mine? 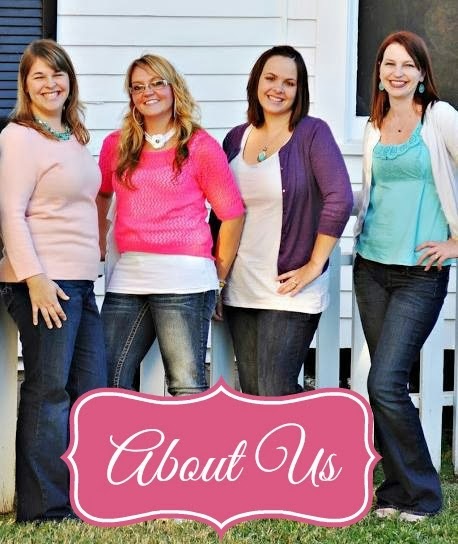 just found your blog- new follower! my son's name is Huck after his great grandpa Huckelberry! SOOOOO cute! I love it! 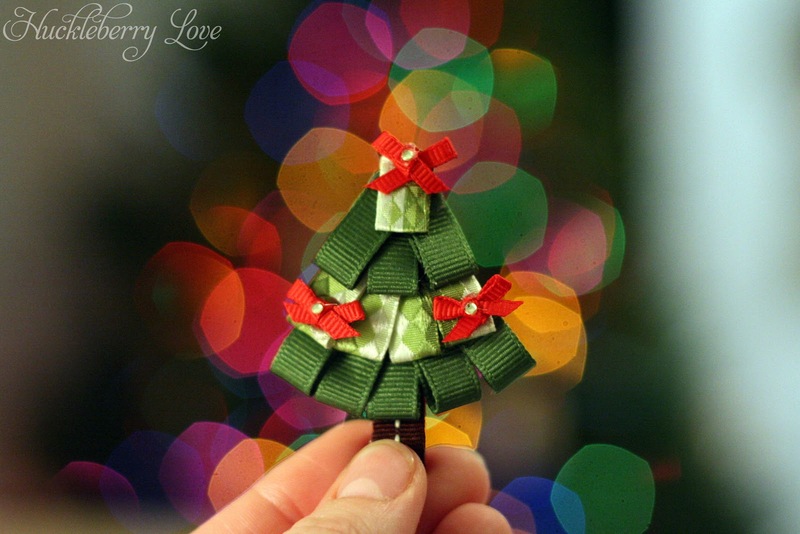 What patience you must have to make it so intricate and lovely! 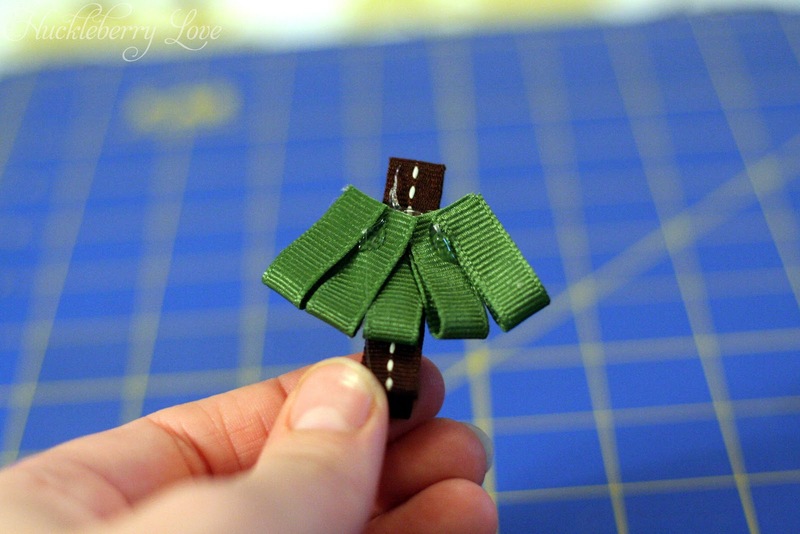 This bow is fabulous (as is the shirt you made)! 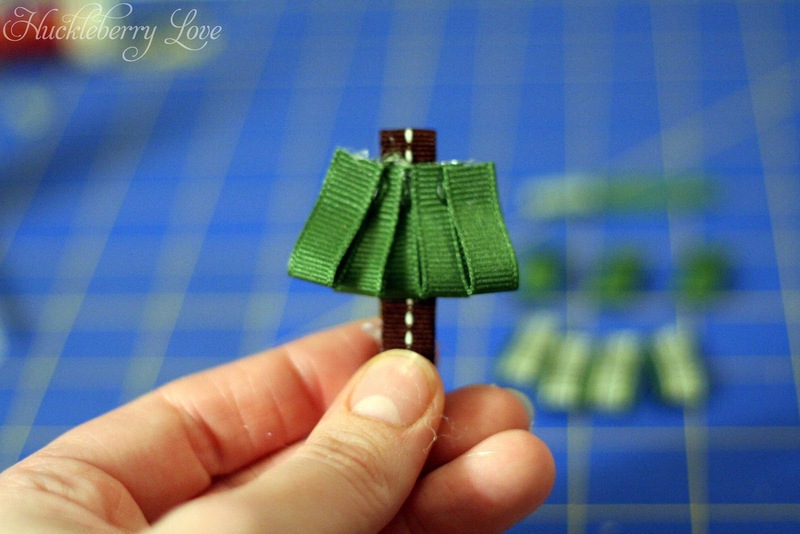 Thank you so much for sharing the tutorial. 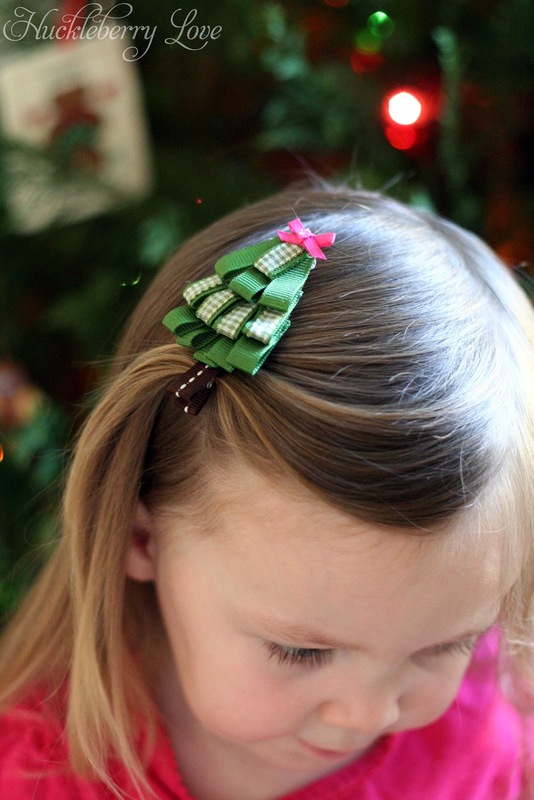 My 3 year old daughter also desires matching accessories and I know she will love this bow. Can't wait to make it for her. I'm visiting from the link party at A Glimpse Inside.